On this day in history, Elizabeth Boleyn, Lady Wiltshire, wife of Thomas Boleyn and mother of Mary, Anne and George, was buried in the Howard Chapel of St Mary’s Church, Lambeth. Sir John Russell, Lord Comptroller, was the chief male mourner and Elizabeth’s half-sister, Katherine Howard, Lady Daubenay, was the chief female mourner. 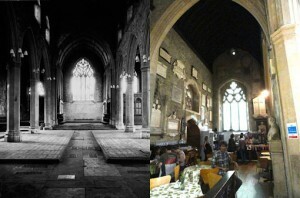 St Mary’s Church, Lambeth, is now a garden museum and Elizabeth’s tomb is not visible because it lies underneath the wooden floor of the museum cafe. Although some people have commented on how awful this is, the museum actually saved the church and so saved the Howard tombs. Many people wonder if the fact that Elizabeth is not buried next to her husband at Hever is evidence of some kind of separation between them but as Linda Saether points out in her wonderful article about her search for Elizabeth’s tomb, there are many Howard women buried at Lambeth and she wondered if “Howard women expected to be ‘brought home’ for burial in the Howard Chapel regardless of whom they married.” We also know that Elizabeth died at Baynard’s Castle in London so perhaps it made sense for her to be buried in London rather than to be taken back to Hever in Kent. I guess we’ll never know! It is not known what Elizabeth Boleyn died of but she was reported as being “sore diseased with the cough which grieves her sore”3 in April 1536, and Anne Boleyn, when arrested and taken to the Tower in May 1536, had commented “O, my mother, [thou wilt die with] sorow”4. Perhaps Elizabeth had been fighting tuberculosis,5 we just don’t know. I do enjoy these articles but forget to comment usually. I would love to know more about Elizabeth but as you say we will never really know. Thank you for the photographs it is great to be able to see things that are too far away to visit. Thomas, second Duke of Norfolk ‘being hole of mind and of good memory’ left instructions in his will of 1514 for his tomb before the high altar at the priory of Thetford in Norfolk to be executed by ‘Master Clerke, Master of the King’s works at Cambridge, and Wassel free mason of Bury, and pictures of us and Agnes our wife to be set together thereupon’. This Agnes is, of course, Katherine Howard’s step-grandmother who was buried at Lambeth forty years later. She had survived her involvement in the girl’s disgrace at Norfolk House opposite the church – just – and died in 1545. After it was dissolved in 1539 Thetford Priory became Howard property with the priory church still functioning, and having died in Norfolk Duchess Agnes was buried there as a temporary measure, which could mean that the magnificent tomb she had prepared at St Mary-at-Lambeth, where she was finally interred a few months later, was not yet finished. Why had she gone against her husband’s wishes and prepared her tomb at Lambeth? Had it become apparent at an early stage that the actual abbey and priory churches themselves would not survive and that before long the Howard ancestors would have to be disinterred and moved elsewhere, and this is the reason she prepared her tomb in sight of her Lambeth home? This theory doesn’t entirely stand up, as one would expect a woman of mature years to have begun building her tomb sooner rather than later and if she started before the mid-1530’s, when she was in her mid-to-late fifties, Agnes could hardly have been anticipating the dissolution of Thetford Priory. In Agnes’s case, a Howard by marriage but born a Tilney of Lincolnshire, maybe she was just emotionally attached to the area – this was her local church. Could this be said for Elizabeth Boleyn, though? The Howard Chapel itself wasn’t particularly old (although the church itself was) having been completed about 1522. I have found no mention of Elizabeth being associated with Norfolk House (although she might have been) and wonder was she more likely to have been raised at the Howard mansion at Kenninghall, or the castle at Framlingham? In her case the dissolution would appear not to have represented a threat, as shown by her husband’s burial in the church at Hever. I am still ‘on the case’ as far as Duchess Agnes and Norfolk House go but had to put them aside for a while to finish other research coming up for publication. I hope to go to the Garden Museum yet again shortly and understand that if repair/extension work is to be carried out on the Howard Chapel in the (fairly distant) future, there would be an archaeological investigation and search for the tombs. Please tell Linda I will be in touch when/if there is any news of that coming up. The poor Lady Elizabeth, I feel so much sorrow for her, seeing two of her children destroyed in such a brutal way, and being unable to do anything about it. What ever health problems she had would not have been helped by having to bear witness to those soul destroying events. It is a shame that her tomb is not visable anymore, but at least the building where she rests has been saved and you can visit the site. One good thing though, she did receive a proper burial respecting her status, which is more than can be said about the way her children were treated after their deaths. I really hope that she has found peace.